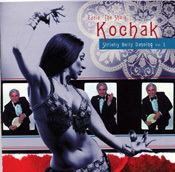 Music for Bellydancing - features Hakki Obadia. I first purchased this as an album in 1976 and used it throughout my training to professional level and beyond to teaching others from beginning to intermediate performance level. Contains music for complete performance from slow to fast shimmy, veilwork to floorwork, sword and cane. Very diversified and definately fun!